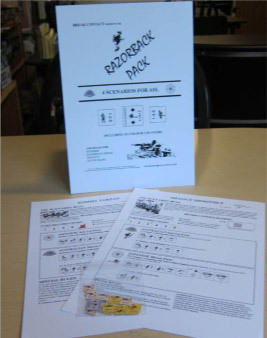 In early 2011, Break Contact emerged from a period of relative inactivity to release two new items, one of which is this product, the Razorback Pack (RP) mini-pack. Designed originally as a special item for tournament directors to give out as a prize, it was not initially intended for general release (following in the tradition of George Kelln’s tournament-only packs Panzer Aces, Combat History of Schwere Panzerjäger Abteilung 653, and The Battle for the Abbaye de Ardennes). However, designer “Macca” eventually decided to give the ASL community at large a chance to own it as well (though circumstances are not clear, the initial impetus behind this decision may have been an inquiry by this Web site as to the nature of the Razorback Pack). Because of its origins, the pack is quite idiosyncratic, designed as an opportunity to do something a bit different. 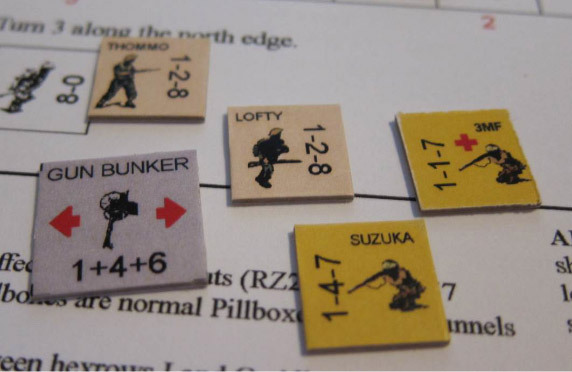 The scenarios are all very small, and most include individual soldier counters (14 of which, Australian and Japanese, appear in the countermix). These are not leaders or heroes, but rather normal individual soldiers, and rules are included for deploying half-squads into such soldiers. They are treated essentially as substandard heroes. The RP rules also include instructions for a “Gun Bunker” with two separate CAs, as well as rules for razorback ridges, the sharp terrain features that played an important role in much of the fighting on New Guinea. Though razorback ridge rules are needed for ASL, these particular rules would not be suitable for adoption in general, because they are dependent upon the Soldier rules. All four scenarios are set in the so-called Shaggy Ridge area of New Guinea in late 1943/early 1944 (for a good book on this fighting, see Phillip Bradley’s On Shaggy Ridge). BC23 (Kill ‘Em) represents a platoon-sized Australian attack (4 squads, 2 crews) against a tiny Japanese force (3 half squads, 7 Soldiers, 2 leaders). BC24 (Shaggy Shootout) depicts an Australian attack (11 squads) against a Japanese gun position defended by 2 crews, 2 half squads, 4 Soldiers, and 2 leaders. BC25 (Tommy Tarzan) simulates another Australian attack, by 2 squads, 3 half squads, 1 hero, and 4 leaders, well armed with DCs, against 3 Japanese pillboxes defended by 1 squad, 1 half squad, 6 soldiers, and 2 leaders. BC26 (Two Man Front), the smallest scenario, depicts an Australian attack by 2 half squads, 1 hero, and one leader, against 3 Japanese Soldiers and a leader in two pillboxes. Obviously, this is an unusual pack and its “popcorn shrimp” scenarios will not be appealing to everybody. That is one reason why the RP was originally intended only as a prize. However, its newly-wider availability allows people to decide for themselves whether they might want to try it. Certainly collectors and PTO enthusiasts ought to give it a look.